The pattern for my new friend Idlewood is now up for sale for $6.00. Maybe it wasn’t quite that cold out tonight, but I wore it around anyway! Yay, Fall is coming! Idlewood is a top down, short sleeve, tunic with a huge cowl that may be worn as a hood. It is knit in one piece from the edge of the cowl down to the bottom hem and optional patch pockets are added. I wanted something to wear to the Rhinebeck NY Sheep and Wool Festival (Yay!) that I wouldn’t be too warm in during the afternoon sun and that would fit comfortably under a jacket in the evening. And of course, it had to have a hood and pockets! Maine Organic from Green Mountain Spinnery is listed as worsted weight, but I knit this at 3.75 sts per inch and just love the fabric. Wonderfully Wooly from GMS is the perfect substitute if you would like a more colorful option. Both these yarns are spun the same and will look and drape the same at the same gauge, and are very rustic wooly yarns, which I LOVE. If you are looking for a soft wool option, Osprey from Quince and Co is perfect and amazing and super soft. Sample shown with 1” negative ease. ALSO! Have you seen my lovely and talented friend Kristen’s new website and beautiful new designs, she uses not only yarns that are pretty, but that are eco friendly as well. Incredible yarn info! 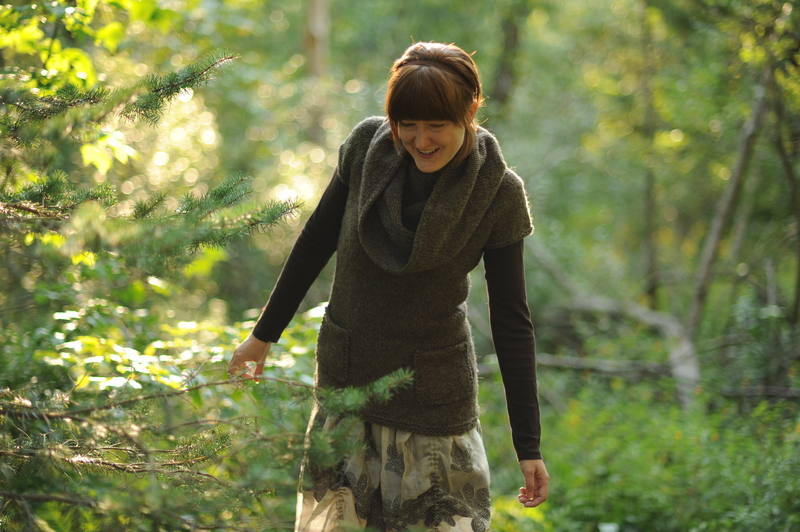 The site is Caterpillar Knits- http://caterpillarknits.blogspot.com/ it just went live. i don’t have time to knit ANYTHING, but i think a few hanks of osprey might jump into my cart for this next time i’m on the quince & co website. it’s totally adorable! Fall is coming here too. Great sweater and photo. Just lovely! I just found your site – you are my favorite designer, hands down, and I’ve been looking through thousands of books and patterns… (I’m new to this.) Your eye for beauty is so refined, and your patterns are efficient and so well-thought-out, and you are the only designer whose fit looks like it will be Anthropologie-worthy when I’m done. Everybody else is just so stinkin’ bulky with their designs! I’m young and I want to look like it! (And so should everybody else, no matter what their age is!) I am truly in love with everything about your creativity. I am brainstorming about turning your castle pullover into a wedding dress, that is how in love I am. THANK YOU. LOVE LOVE LOVE! It’s going in the queue! I keep coming back to Idlewood. It looks perfect for Autumn into winter. If I could just focus and get my Christmas gifts finished up! !